When it comes to household cleaning, you want a quality clean, but you also want a good price— so how do you find the balance? This vacuum review is going to look at Roomba 690 vs. 890 and put each of these models to the test. The Roomba 890 is moderately more expensive than the Roomba 690, but also comes with quite a few additional bells and whistles. Are the added features worth the added cost? This review is going to compare all aspects of these robot vacuums including design, how it cleans, size, accessories and parts, cleaning performance, usability, maneuverability, maintenance, battery, noise, value, warranty, return policy, and company. While the exact importance of each of these factors is a bit subjective, they all work together to project an assessment of the overall product value. If you want to see how all of the Roomba vacuum models compare, be sure to also check out our Roomba Reviews. There are a lot of cool features with each of thee vacuums and there’s a lot of ground to cover so let’s get started in this robot vacuum showdown — Roomba 690 vs. 890! GUIDE: Want to know more about how we score vacuum reviews? Click here to see our outlined vacuum review process. The Roomba 690 a powerful budget-conscious robot vacuum. It offers wifi connectivity, voice control, and great cleaning performance. This model includes one virtual wall barrier, has the bristle style brushroll, and operates with iAdapt 1.0 navigation technology. It lacks the memory feature and advanced brushroll of the newer models, but at this price point, this robot vacuum is a great value. Wifi connectivity and voice control enhance usability. Basic navigation and lack of memory-mapping may be a problem for complicated floor plans. Bristle style brushrolls can be hard to maintain, depending on debris types and use. The Roomba 690 offers excellent cleaning performance and with a simplified user interface. This make it an easy and effective robot vacuum to run. However, if you have pets or long hair in the household, the bristle brusholl may be problematic. The Roomba 890 is a more expensive model, but the extra costs do come with significant upgrades. This robot vacuum offers wifi connectivity, voice control, and excellent cleaning performance. Upgrades to the 890 model include advanced dual brushrolls (for fewer tangles), a memory-mapping feature, advanced HEPA filtration, and a full bin indicator. Advanced dual brushrolls are better for pet hair or long hair. Cleaning performance is not substantially better than the Roomba 690. Although a bit pricier, the Roomba 890 brings a solid value. For pet owners, the dual brushrolls are almost a necessity, in my opinion, providing easier cleanup and brushroll maintenance. In addition, if you have a tricky home layout or multiple rooms, the memory-mapping feature can help better navigate your home. The Roomba 690 has a two-tone aesthetic, using black and silver, with bright green accents for special features. The green is used to highlight the carrying handle as well as the dust bin release where you can empty the bin or clean / replace the filter. The center panel has a “CLEAN” button which starts an auto clean cycle. You can program scheduled cleanings using the iRobot Home app or using voice control via Google Assistant or Amazon Alexa. The design of the Roomba 890 is similar to that of the 690 model. It has the same style of cleaning buttons, handle placement, bumper style, and dust bin release. The aesthetic of the 890 is a little more cohesive with the dark gray and black. There are no brightly colored accents on this model, that note special features, however, the design is so simple, the features feel pretty intuitive. The Roomba 690 cleans using a spinning side brush, central bristle style brushroll, and vacuum suction.The spinning side brushes help to push debris from edges and corners and into the path of the central brushroll. This bristle brushroll has the same average lifespan as the dual brushrolls and costs a little less to replace. There is no memory feature on the 690, so this model relies solely on dirt detection and infrared light sensors to navigate the space. When the Roomba detects especially dirty areas, it will spend more time in those spaces before continuing onto other rooms. Edge sensors along the front of the vacuum combined with drop detection technology helps prevent the Roomba 690 from driving over stair edges or lofted spaces. The 690 model uses the AeroVac filtration system to filter out fine particulate and debris. This filter is a bit larger and curved compared to the sleeker design of the AeroForce filter (in the Roomba 890). The AeroVac filter does take up more room in the dust bin, but the level of filtration is comparable. The Roomba 890 uses a similar three-stage cleaning as the 690 model, but has an advanced brushroll. Unlike the 690’s single bristle-style brushroll, the Roomba 890 uses dual brushrolls, which Roomba calls “debris extractors.” This dual system helps to prevent tangles and is especially useful for homes with pets or people with long hair. The edge sensors are in the same place as on the Roomba 690, but the 890 does have a memory-mapping feature so navigation is improved with this model. Memory-mapping allows this model to use its infrared light to read the space and remember obstacles and layouts. This increases the robot vacuum efficiency, so it doesn’t continually bump into the same things for every cleaning cycle. The other big change here is the HEPA filtration system. The Roomba 890 uses an upgraded system called AeroForce which is basically a smaller filter, leaving more room for debris in the dust bin, without sacrificing filtration. The Roomba 690 is 13″ in diameter and 3.6″ tall. It’s pretty average on the spectrum of robot vacuum sizes and doesn’t seem to have much trouble sneaking under furniture or into tight corners. The Roomba 890 is 13.9″ in diameter and 3.6″ tall. Again, this size is pretty standard for comparable robot vacuums and should easily be able to maneuver throughout tight spaces and under most furniture. RELATED: Neato vs. Roomba, who is the king of clean? On each of those floor types, we test rice, dry cereal, kitty litter, and sugar. For the robot vacuum cleaning tests,we allow the vacuums to clean for up to 15 minutes, or less time if it stops on its own. For the hardwood tests, the Roomba 690 did great, collecting 100% of large debris, like cereal, while only collecting 95% of smaller debris, like sugar. The Roomba 690 continued to do well onto the low pile carpet test, with the exception of sugar, where it only captured 72% of debris. On the rice, cereal, and kitty litter tests, it scored 98-100%. On the high pile carpet, the Roomba continued to perform excellently for the rice, cereal, and kitty litter tests, and struggled more with the sugar test, only collecting 66% of debris. On the hardwoods, the Roomba 890 did excellent, collecting 100% of debris of the rice, cereal, and sugar, and a 92% of the kitty litter during each test. For the low pile carpet, the cleaning performance for rice, cereal, and kitty litter was still exceptional — 100% for all three tests. The sugar test proved to be a bit more of a struggle, as the 890 only collected 65% of the debris dropped. The high pile carpet test yielded results similar to the low pile carpet test. The rice, cereal, and kitty litter tests all collected 100% of debris, while the sugar only collected 50% of debris. The usability for the Roomba 690 is quite good. With the wifi connectivity, its user interface is simple and intuitive. Setup is as easy as unboxing it, installing the spinning brushes, charging it up, and letting it loose. App setup took just a few minutes. Of course, with the 690 or 890, using the app is optional. You can start any cleaning cycle by just pressing the “CLEAN” button. The usability for the Roomba 890 is comparable to the 690, since both vacuums use the iRobot Home app and have wifi connectivity. Setup includes unboxing, installing the spinning brush, allowing time for a full charge, and you’re ready to clean. The user interface is extremely similar and easy to use. Complete app setup, including registration and robot setup only took just a few minutes. The maneuverability of the Roomba 690 is a little less than that of the Roomba 890. The biggest difference here is that the 690 does not have memory-mapping and relies solely on dirt detection technology to identify dirty spots and traffic patterns. This approach is a little less efficient, as the 690 may continue to bump into the same obstacles and hazards multiple times within a cleaning session. The maneuverability of the Roomba 890 is a bit more advanced, compared to the Roomba 690. The on-board camera and sensors use memory-mapping to create a map of your home, which Roomba then can use to navigate your home more efficiently. The 890 also has the same dirt detection technology that the 690 model has for high-traffic areas. The maintenance for the Roomba 690 is pretty consistent across many Roomba models. Emptying the dust bin and regularly checking the filter are good maintenance tasks to help your Roomba’s parts and accessories last longer. The 690 model also uses the bristle-style brush, which may require additional maintenance, compared to the brushroll on the 890 model. This is especially true if your home has pets or people with long hair, which tends to tangle in the brushroll easily. The Roomba 890 maintenance is comparable to the 690 in many ways. Maintaining the dust bin, filter, and brushes are simple tasks that don’t take long, but are critically important to keeping your Roomba running smoothly. The cost to maintain the unit is around $36 / year. The Roomba 890 uses the advanced dual brushrolls (debris extractors), which are rubberized to help prevent hair tangles — from both pets and people. This brush is also easier to maintain, compared to the older bristle-style brush. The battery of the Roomba 690 has a 90 minute run time and 1,800 mAh capacity. The battery of the Roomba 890 has a 90 minute run time and an 1,800 mAh capacity. We put all of the vacuums through a standard noise test at Modern Castle, which measures the decibel level from 3′ away from the vacuum as it is running. If you’re looking for a solid deal, the Roomba 690 is incredibly hard to beat. While it lacks some bells and whistles, like the advanced brushroll and advanced filtration system, this robot vacuum offers excellent cleaning performance at an incredible price. It remains one of the best value robot vacuums we have tested to date. The value of the Roomba 890 is a little less than the 690 value, in my opinion. While the 890 certainly does have some nice upgrades, it was a little bit concerning that the cleaning performance was not noticeably better than the base level 690 model. Nevertheless, the Roomba 890 does pick up some points with improved navigation, floor plan mapping, and other advanced features. Both the Roomba 690 and the Roomba 890 are strong contenders. The cleaning performance for each of these vacuums is comparable. While the Roomba 690 will save you some money, the Roomba 890 offers improvements and added features that could be a real deal breaker, depending on what you’re looking for. Both the 690 and the 880 have a similar user interface, wifi connectivity, voice control, edge sensors, dirt detection, drop detection, accessories, noise, and dust bin capacity. As added features, the Roomba 890 also offers an improved HEPA filtration system, memory-mapping technology, and advanced dual brushroll for pet hair or long hair. Both Roomba come with the virtual wall barrier, but the addition of the advanced brushrolls as well as the upgraded filtration system, really help give the Roomba 890 the upper hand here. On an average of all of the cleaning tests we performed, the Roomba 890 collected 79.07% of debris while the Roomba 690 collected 80.02% of debris. While raw cleaning performance was comparable on our testing lane, I feel that the improved navigation and mapping will yield better house-wide cleaning from the Roomba 890. Usability Draw Both of these Roomba use wifi connectivity and app control for easy usability. In addition to the app, you can always start a cleaning cycle by simply pressing the "CLEAN" button on the face of the vacuum. Maintenance Draw When using generic parts, the Roomba 690 and Roomba 890's maintenance costs are comparable. Even replacing the battery isn't too expensive (especially from 3rd party manufacturers). Battery Draw Both of these vacuums offer a 2-3 hour charge time and up to a 90 minute run time. Noise Draw The Roomba 690 and Roomba 890 both emitted 68 dB from 3' away during the Modern Castle decibel test. In terms of value, with all factors considered, I would say that the Roomba 690 is the better value, although the 890 offers some interesting features. The Roomba 690 has got a great price, excellent cleaning performance, and the convenience of wifi connectivity or voice control. These added features make the Roomba 690 feel like a modern robot vacuum, without having to pay $$$ for a tech-savvy robot vacuum. Want a great value – Compared to the Roomba 890, the Roomba 690 is notably less expensive. It offers many of the same features and has excellent cleaning performance. Want excellent cleaning performance – The cleaning performance of the 690 was equivalent, and even a little better, during some of our cleaning tests. For a budget price and a quality, clean the Roomba 690 is hard to beat. Want a smaller footprint – If you have a home with a tight layout or unique furniture, the smaller size of the Roomba 690 may be a selling point for you. The Roomba 890 is about 1″ wider in diameter. For advanced features, the Roomba 890 may be the better choice. The dual brushrolls are great options for pet owners or people with long hairsince the improved design tends to lead to fewer tangles. Overall, the technology advancements makes the 890 a smarter robot vacuum. Memory mapping adds some logic to the cleaning and cycles and makes cleaning whole homes with multiple rooms a little easier. The full dust bin indicator is also a nice addition. Want an improved filtration system – The AeroForce filtration system, uses a more efficient design and takes up less room in the dust bin. Want an improved brushroll – This newer design of brushroll uses two debris extractors to capture dust, dirt, and debris. This configuration helps to reduce tangles and may be easier to maintain, compared to the older bristle style brushroll. 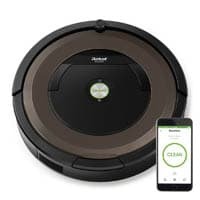 Want memory-mapping – Although the cleaning performance of the Roomba 690 and the Roomba 890 is comparable, the efficiency of the 890 is superior. The 890 can more easily navigate the space, spending more time cleaning and less time getting lost. Memory-mapping also helps Roomba to keep from bumping into the same obstacles during every cleaning cycle, as it learns more about it’s environment each time. November 22, 2018 – Updated a few small formatting issues. Also updated run time, which has increased from 60 to 90 minutes with updated version of both the 690 and 890. January 12, 2018 – Initial version of the page published.